This soup recipe was a long time coming! Over the years, I made some lackluster lentil soups that never saw the light of day on this website. No vegetarian food blog would be complete without a proper lentil soup, though, so I perfected one of my own. The original title of this recipe was “Spiced Vegan Lentil Soup,” which is accurate, but a mouthful. 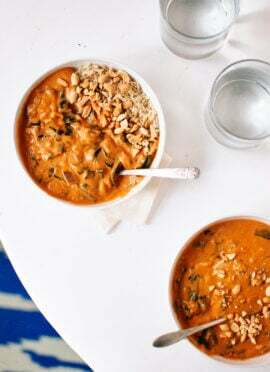 With over 500 five-star reviews, I think it’s safe to call this the Best Lentil Soup. Period. 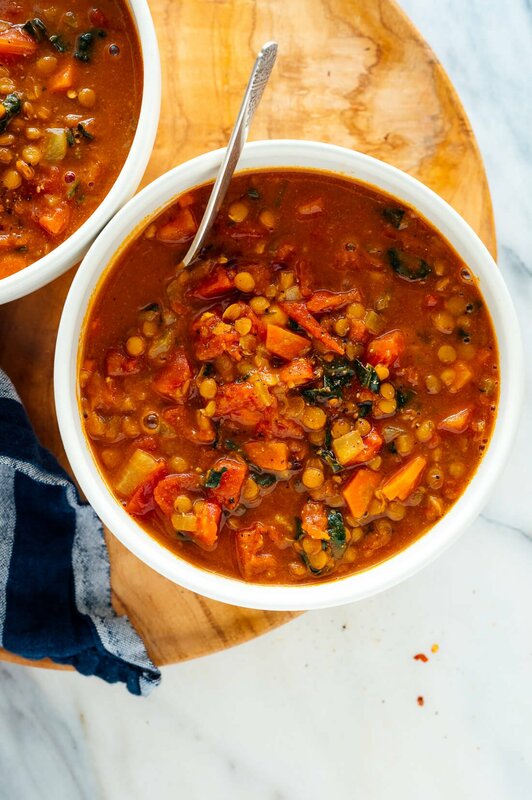 Whether you’re looking to lighten up your meals or warm up with a steaming bowl of soup, this healthy lentil soup recipe is for you! 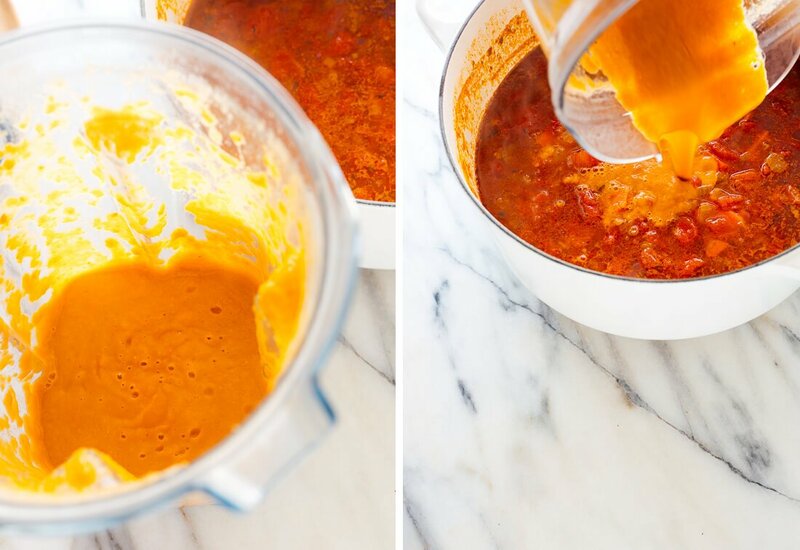 It’s one of my all-time favorites and I hope it becomes a staple in your kitchen as well. 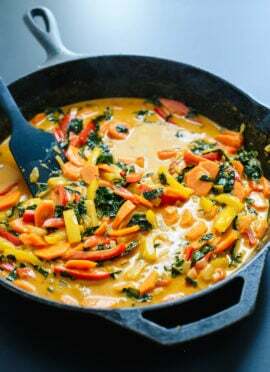 The recipe calls for seasonal vegetables and affordable pantry ingredients, but tastes gourmet. 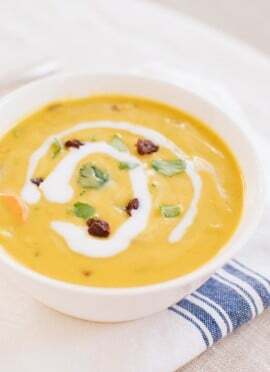 This lentil soup has an amazing hearty texture that’s lightly creamy (yet there is no cream). 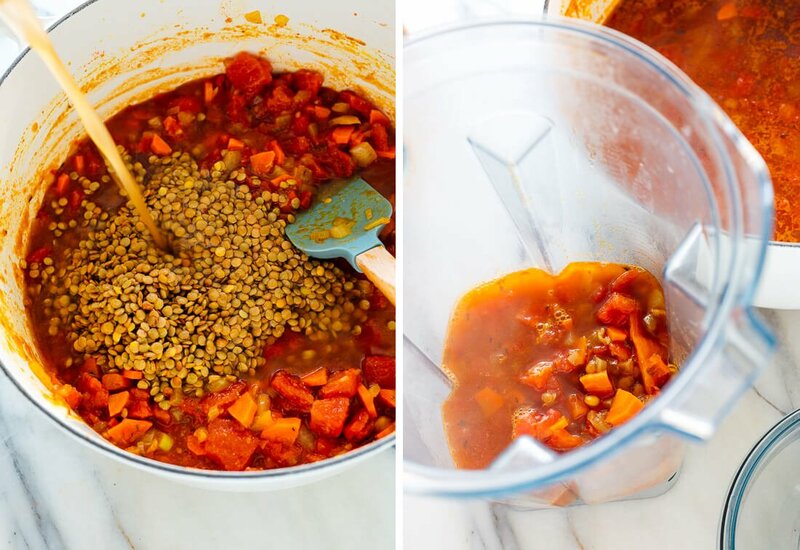 The trick is to blend up a portion of the soup once the lentils are tender, and then pour it back into the pot. It’s like magic. This nutritious, well-balanced soup counts as a meal if you enjoy a generous portion. Lentils are rich in protein, fiber, iron and folate. Lentil soup packs well for lunch in a leak-proof container, and it tastes even better the next day. This soup freezes and defrosts well. 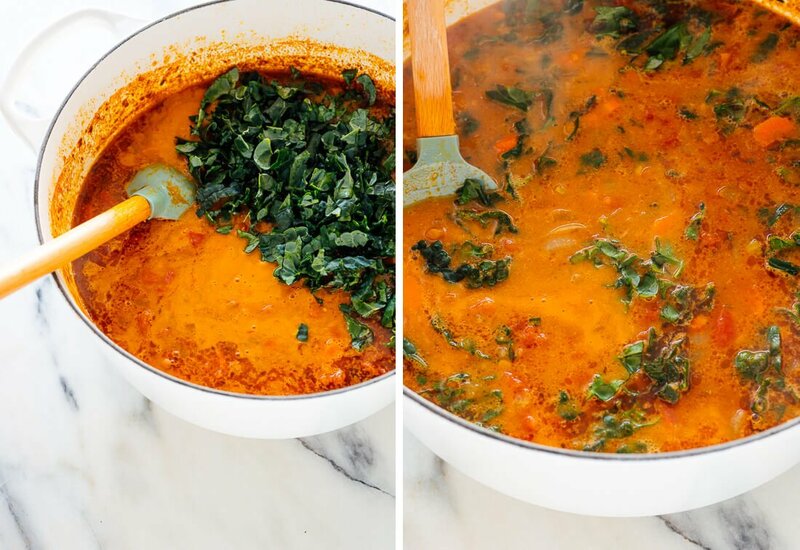 Make soup now and enjoy it later! 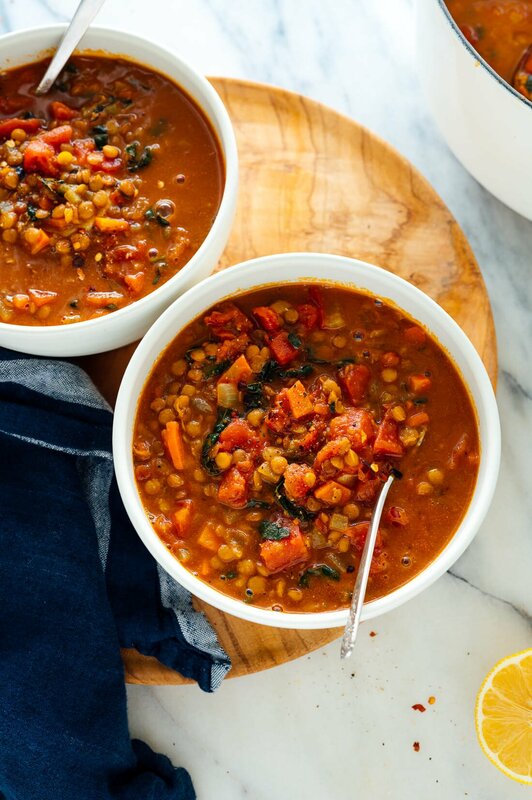 Please let me know how this lentil soup turns out for you in the comments. I’m always so eager to hear from you. If you love this soup, check out my hearty vegetarian chili, favorite black bean soup and pinto posole. You can check out all my soup and stew recipes here. 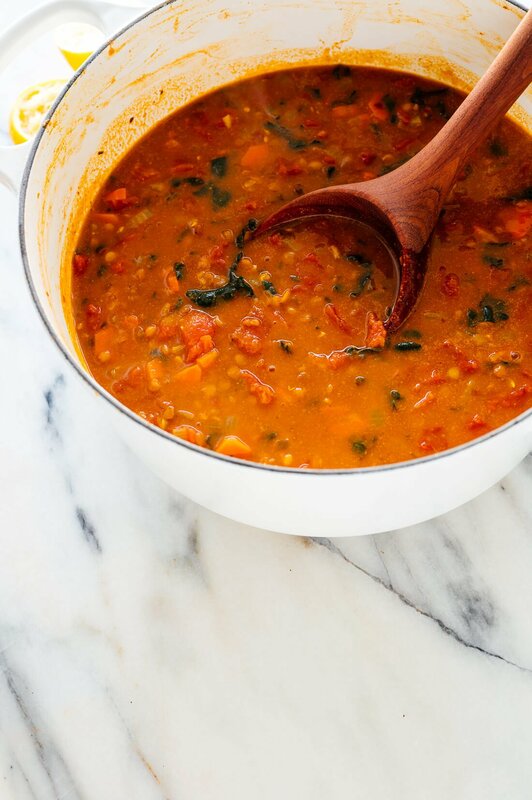 Don’t miss my lentil minestrone recipe in my cookbook—if you’re a fan of this soup, you’re going to love it. Add the garlic, cumin, curry powder and thyme. Cook until fragrant while stirring constantly, about 30 seconds. 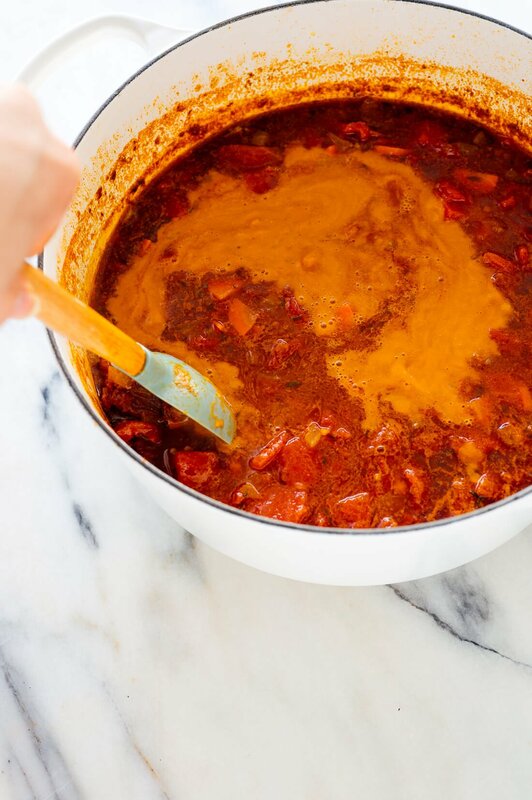 Pour in the drained diced tomatoes and cook for a few more minutes, stirring often, in order to enhance their flavor. Pour in the lentils, broth and the water. Add 1 teaspoon salt and a pinch of red pepper flakes. Season generously with freshly ground black pepper. Raise heat and bring the mixture to a boil, then partially cover the pot and reduce the heat to maintain a gentle simmer. Cook for 25 to 30 minutes, or until the lentils are tender but still hold their shape. Add the chopped greens and cook for 5 more minutes, or until the greens have softened to your liking. Remove the pot from the heat and stir in 1 tablespoon of lemon juice. Taste and season with more salt, pepper and/or lemon juice until the flavors really sing. For spicier soup, add another pinch or two of red pepper flakes. Serve while hot. Leftovers will keep well for about 4 days in the refrigerator, or can be frozen for several months (just defrost before serving). Soup recipe roughly based on America’s Test Kitchen’s lentil soup in The Complete Vegetarian Cookbook, with reference to The First Mess’ favourite lentil soup. Recommended equipment: (affiliate links) I love my Vitamix blender and Le Creuset 5.5-quart Dutch oven. 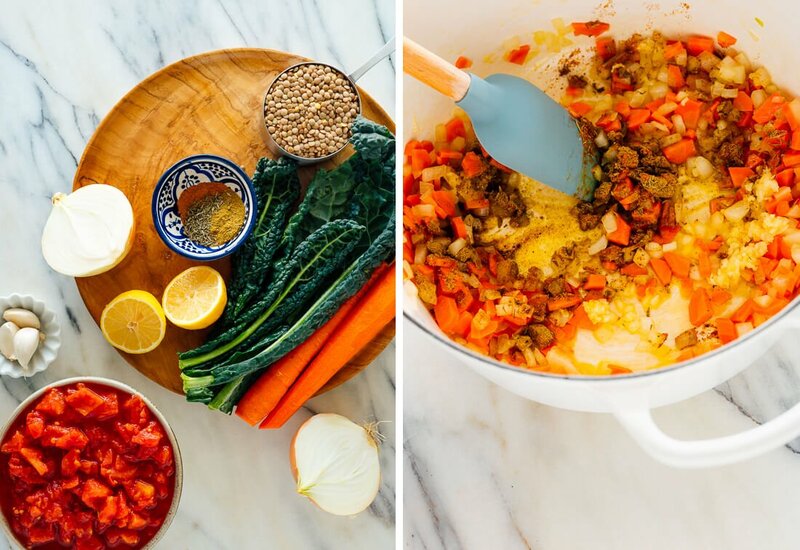 For more of my favorite cooking tools, shop my kitchen essentials. Thanks for sharing, Lisa! Maybe next time he won’t even want the meat. :) I’m glad you were able to make it work to suit your needs. This seriously is the BEST lentil soup I’ve ever had. Love it!!! YUM! I have never made anything with lentils that I liked but decided to give it another go. The reviews looked promising. This soup did not disappoint! The flavors both surprised and pleased me. Wow, I’ll be making this again for sure! I’m glad it didn’t disappoint! Thanks, Sharlee! I love it! Thanks for recommending it to others. I appreciate the review.